These lovely little walnut cookies are one of my favorite holiday cookie recipes. Of course you don’t have to wait for a special occasion. 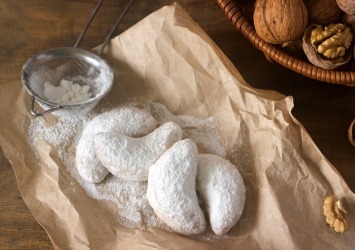 These crescent shaped nut cookies are really easy to make so you can enjoy them any time of the year. You don’t need a special cookie cutter for these lovely little cookies. Just shape the crescents with your fingers. They don’t have to be perfect. When you are cutting the dough into small rolls, as called for in the directions below, just try to make sure the rolls are about the same size. Then your crescents are sure to be similar in size too. Heat the oven to 375°. You will need an ungreased cookie sheet. Cream together the butter and 1/4 cup icing sugar until the mixture is light yellow and fluffy. Blend in the vanilla, flour and walnuts. Shape the dough into small rolls about 1/2 inch in diameter and 1 inch long. Put each one on cookie sheet and shape it into a crescent. Bake the cookies for 15 minutes or until they are lightly browned on the bottom. Cool them for a few minutes then roll them in icing sugar. Cool the cookies completely and roll in icing sugar again before storing. Makes about six dozen (72) cookies. This recipe makes quite a few cookies, so you may want to bake a couple of cookie sheets at a time. When a recipe calls for the butter and sugar, in this case icing sugar, to be creamed together it is important to mix them together really well. The lighter and fluffier the mixture becomes before the flour is added, the lighter the cookies will be. Look for a light butter yellow color to the mixture. Make sure the nuts are finely chopped. These are delicate, elegant cookies and look and taste best with small pieces of walnut. The cookies look prettiest if they are not entirely flat. Round them on the top as you see them in the image. If it seems too difficult for you, don’t worry. Whatever shape they are in they are still yummy delicious. You can replace the walnuts with finely chopped pecans if you prefer. Both will be delicious. Look for more of our easy dessert recipes here. Our Christmas cookie recipes are right here. If you like this recipe, please take a moment to Pin it to Pinterest, Tweet about it, Like it on Facebook and leave a comment below. I would really appreciate it. Submit your own recipe below in the comments section. I would love to help you share your creations with the Cookingnook.com community.